Pistachio is one of the tastiest and healthiest nut and has lots of benefits for the body health especially the presence of healthy fats, rich proteins, and various antioxidants has made this small seed to an appropriate food for weight loss and improved heart and intestinal health. In each ounce or 28 grams of pistachio, containing about 49 pistachios, contains 156 calories, 8 grams of carbohydrate, 6 grams of protein, 30 grams of fiber and 12 grams of fat, with 90 percent of these lipids are good for the body. Also, this amount of vitamins and minerals in pistachios can provide 24% of vitamin B6 daily, as well as 18% copper, 8% potassium, 14% phosphorus, 16% thiamine and 17% manganese per day. High levels of vitamin B6 in pistachios have the essential functions, including The regulation of blood glucose and the formation of hemoglobin (a molecule that sends oxygen to the red blood cell). Pistachio is also a rich source of potassium, and the amount of potassium in 28 grams of pistachios is more than half the size of a large banana. 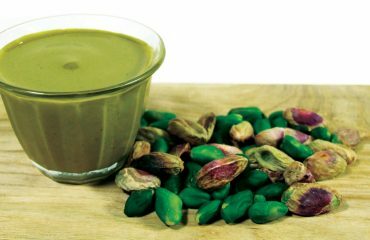 Despite the great benefits of many types of nuts, their calories are generally high, but pistachios are the exception. Every 28 grams of pistachios have only 156 calories, if the same amount of walnuts contains 183 calories. In terms of protein content, pistachios have the highest levels of protein after almonds, as 20% of pistachio weight is protein. Pistachios contain essential amino acids forming protein blocks. Some amino acids need to be present in the diet of the individual and the body can not make them. Arginine is one of these amino acids that accounts for 2% of the amino acids in the pistachios from this group. This amino acid in the body converts to nitric oxide and improves blood flow.